A new lobby exhibit that is attracting the attention of passersby in the MIT Media Lab blurs the line between digital fabrication and biological synthesis. Masterminded by Neri Oxman and the Mediated Matter Research Group at the MIT Media Lab in collaboration with colleagues from Harvard’s Wyss Institute and Tufts University, the final construction of the “Silk Pavilion,” a dome-like structure suspended from the ceiling and covering more than 100 square feet of floor space, was completed with the help of an unusual tour de force: 6,500 silkworms. Wyss Institute Research Scientist James Weaver generated a series of scanning electron microscope images that accompany the exhibit. Using the state-of-the-art electron microscopy capabilities at the Wyss Institute, the images illustrate the structural complexity of the native silk cocoons and provided critical design and fabrication insight for the project. 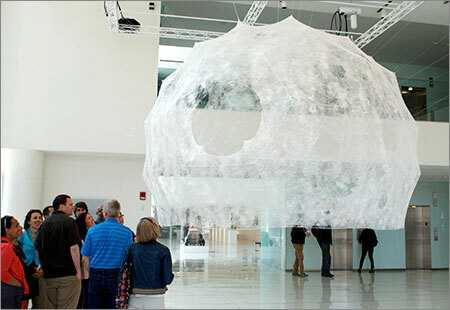 Inspired by the silkworm’s ability to generate a three-dimensional cocoon out of a single one-kilometer-long silk thread, the team designed the overall geometry of the pavilion using an algorithm that mapped a continuous thread path across patches providing various degrees of density. 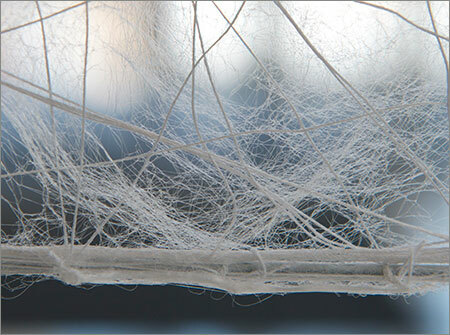 They next used a Computer-Numerically Controlled (CNC) router to generate the primary non-woven fiber structure: 26 polygonal panels made of overlapping silk threads. After stitching the panels together, they let loose an army of 6,500 silkworms around the base of the structure. The worms acted as “biological 3D printers” — exercising their natural silk-spinning skills to fill in the gaps between the panels, and generating a “surprisingly robust structure,” said Weaver. If you were to unravel the silk comprising the massive structure, it would extend from Boston to Hawaii. Silkworms typically require a confined three-dimensional space to spin a cocoon. When placed on a flat structure like the 3D printed panels, they instead spin planar overlapping patches of silk (of varying densities). After pupation, when the worms’ work was complete, the team retrieved them via a catch net that cradled the bottom of the structure. The adult moths that would ultimately emerge can further produce an additional 1.5 million eggs, with the potential of constructing up to 250 additional pavilions. What’s more, the team strategically placed a series of openings within the structure that correspond to a season-specific sun path diagram mapping solar trajectories in space; the openings lock in rays of natural light entering the pavilion from the South and East elevations, directing heat and giving the structure a captivating natural glow. The pavilion was designed and fabricated by the Mediated matter group at the MIT Media Lab directed by Prof. Neri Oxman. Researchers include Markus Kayser, Jared Laucks, Carlos David Gonzalez Uribe, and Jorge Duro-Royo. Key collaborators include Dr. James Weaver from the Wyss Institute and Prof. Fiorenzo Omenetto from Tufts University.